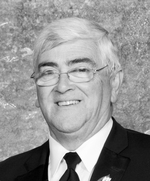 Flemming, Alexander Patrick “Pat” -71, Great Village, passed away in Colchester East Hants Health Centre, Truro on Thursday, September 20, 2018. Born in Halifax, he was the son of the late Clarence Patrick (CP) and Margaret Rita (MacDonald) Flemming. Pat was a graduate of Saint Mary’s University (Comm.) and attended UCLA for his MBA. His career took him across North America in dairy-related ventures with Carnation Milk and Scotsburn Cooperative Dairy, and further spicing up his career at Schwartz Inc. After his retirement, he established a successful B&B, sharing his hospitality, infectious laugh and cooking skills with guests from all over the world. Pat retired from the Great Village District Fire Brigade in the fall of 2017. His skills as an arbitrator proved useful in his work with the N.S. Department of Justice hearing appeals. His interest in sports was diverse: football and hockey at university and higher levels, golf with the guys in Debert and PEI, refereeing minor hockey and racing sedans at Atlantic Motorsport Park. His latent interest in singing blossomed in the Saint James Presbyterian Men's Chorus and related quartet. While he claimed “brown thumbs”, he was president of the Great Village Garden Club for several years. Pat is survived by his wife, Sybil (Card); son, Patrick S. (Sandra) and stepson, Ian Hubbard; grandchildren, Cooper and Grace Flemming and Claire Hubbard, all of Halifax. Also by sisters, Paula (Charlie) Renouf of Arisaig, Catherine (David) MacKinnon of Dartmouth; brother, Don of Arisaig and several nieces and nephews.